Trump said his meeting with Kim didn’t end contentiously but with “a very friendly walk”. 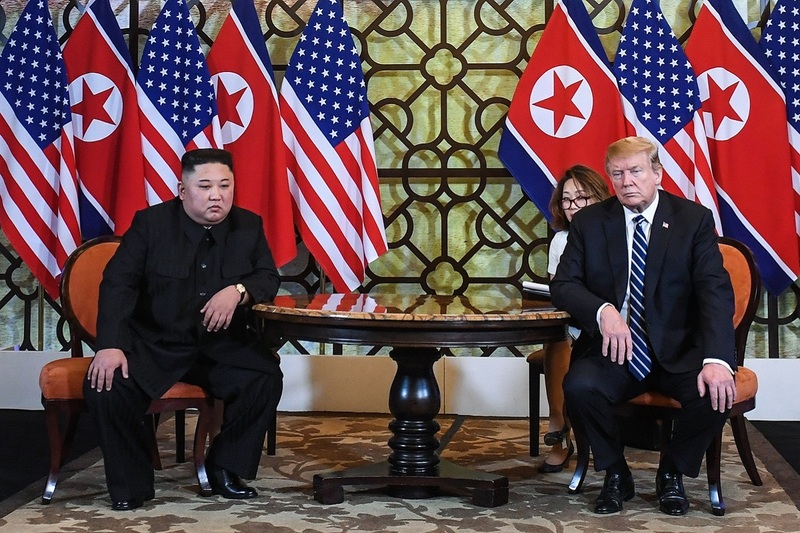 The summit between US President Donald Trump and North Korean leader Kim Jong-un ended on Thursday with no agreement after Washington refused Pyongyang’s demands for economic sanctions relief. Addressing reporters in the Vietnamese capital after the two-day summit with Kim was abruptly cut short earlier than planned; Trump said that he walked away from signing a denuclearization deal with the North Korean leader after they failed to reach an agreement for economic sanctions on Pyongyang to be lifted. “It was about the sanctions. Basically they wanted sanctions lifted in their entirety and we couldn’t do that… We had to walk away. “We had to walk away from that particular suggestion of completely lifting the economic sanctions on North Korea”, Trump said, adding that neither he nor Secretary of State Mike Pompeo “felt it was appropriate to sign an agreement”. “We had papers ready to be signed, but it wasn’t appropriate. I wanted to do it right, rather than fast,” Trump said. According to the US leader, Kim said he was willing to dismantle the Yongbyon complex — the development and testing facility at the heart of North Korea’s nuclear programme — but wanted all sanctions on North Korea lifted in exchange, something the US was not prepared to do. He added that no plans had been made for a third summit with the regime leader. Although no deal was signed, Trump insisted that his relationship with Kim was “very warm” and that he was optimistic that further progress could be made while highlighting the improvements in their bilateral relationship since the US leader took office two years ago. Trump said his meeting with Kim didn’t end contentiously but with “a very friendly walk”. “This wasn’t a walk away like you get up and walk out,” Trump told reporters of the end of the summit. “He has a certain vision, it’s not exactly our vision, but it’s a lot closer than it was a year ago. Eventually I think we’ll get there. With time (the gap) will be bridged at a certain point. But there is a gap”, Trump told the media. The original White House programme for the day had planned for a “Joint Agreement Signing Ceremony” as well as a working lunch for the two leaders, but expectations were abruptly dashed with the cancellation of both. The summit, the second between the two leaders in less than a year, was held to start the stalled denuclearization of the Korean Peninsula, as agreed at their first meeting in Singapore last year. Kim and Trump had met earlier on Thursday at the five-star Metropole Hotel in central Hanoi during which the North Korean leader had said that he would not have attended the summit if he did not want to denuclearize.